Educating our young people is important to the future of America. For that reason, free elementary education has been provided by every state and every town in America. Since WWII, America’s need for college-educated young people has grown, in a more sophisticated, more competitive world. College educated students no longer are a luxury for America; they are a necessity. Many of America’s bright students are unable to afford a college education, especially not in better colleges. The U.S. federal government is Monetarily Sovereign, meaning it creates dollars at will. It never can run short of dollars. The federal government has the unlimited ability to pay for anything. The federal government’s responsibility is to advance the interests of the United States. Putting America’s young people into debt, a debt so suffocating it cannot even be discharged in bankruptcy, does not advance the interests of the United States. An article titled, “The Fed’s Financial Accounts: What Is Uncle Sam’s Largest Asset?” by Doug Short, 12/9/16, includes the following graph. 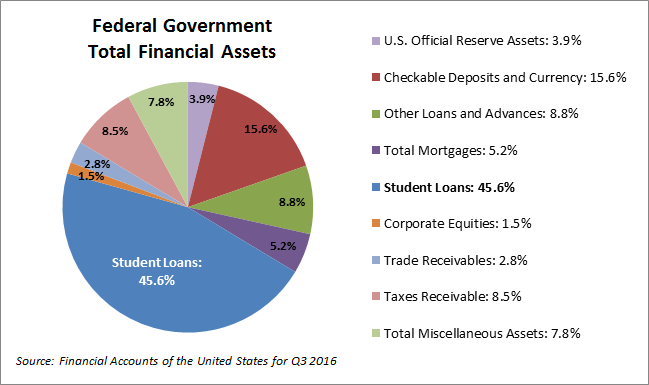 The single largest asset on the Federal government’s balance sheet is Student Loans — the amount students owe to the federal government. Here we see the massive increase in student indebtedness to the federal government, especially in just the past six years. The federal government not only lends money to students — money it should give without asking for its return — but it charges students interest. And these are not low rates. Impoverishing loans must be paid back with high interest rates. If you wanted a plan to discourage college while also discouraging economic growth, this is it. She’s beating the drum, but with the wrong stick. The federal government making a profit on students is ridiculous. Being Monetarily Sovereign, the government neither needs nor uses profits. All dollars sent to the federal government disappear from the money supply. In other words, they are destroyed upon receipt. Federal profits are a net loss to the economy. Senator Warren complains about interest rates when she should complain about the loans themselves. The big debate in Congress is how much interest to charge students. And there are several complex, convoluted plans afoot. But, the federal government never can run short of dollars. It never needs to ask anyone for dollars — not you, not me, not China, not our students. It is the U.S. states that are monetarily non-sovereign, so can and do run short of dollars. Nevertheless, they spend billions to support schools, grades K through 12. So college attendance — which benefits all of America — has become a widespread hardship. If the monetarily non-sovereign states can support grades K-12, surely our Monetarily Sovereign government can and should support grades 13+. We already have a model plan. It’s called “Medicare.” Although there are differences between healthcare and education, we can learn from the parallels. There are more than five thousand public and private hospitals in the United States. Each is unique in terms of geography, reputation, specialties, size, tuition, staff, etc. Coincidentally, there are almost five thousand public and private colleges in the United states. Each is unique in terms of geography, reputation, specialties, size, costs, staff, etc. Medicare has determined procedures for compensating the great variety of hospitals and healthcare personnel. Similar procedures could be used for compensating the great variety of colleges and educational personnel. We could call the program “College-aid” or something similar. Tuition, books & materials, tutoring, housing, and a meal stipend all would be covered according to limits set by “College-aid” — similar to the way Medicare pays. College education helps America to be economically competitive. Federal deficit spending costs taxpayers nothing, and grows the economy. College loans discourage college attendance and damage the ability of college students to create new businesses. The federal government should institute a “College-aid” program, similar in methods to the Medicare program. The above focuses on college financing. K-12 financing has its own difficulties. Like college, which largely is financed by monetarily non-sovereign students and parents, K-12 is largely financed by monetarily non-sovereign state and local communities. As with college education, and healthcare, the richer receive the best and the poorer receive the worst. But the biggest difference, regarding K-12, is not just the money spent on schools, but also the school and family environments. Consider two high schools in Illinois, New Trier Township High School, and Dunbar High School, Chicago. “New Trier offers a rigorous college preparatory curriculum and routinely ranks among Illinois’ very top schools for academic achievement. “New Trier offers numerous opportunities for learning and involvement outside of the classroom in activities, athletics, fine/performing arts, and social service. “Its 35 interscholastic athletic teams have won more athletic state championships than any high school in Illinois interscholastic history. “New Trier also offers more than 150 student clubs, many with a service component. A comprehensive Student Services program serves students’ social and emotional growth in a variety of ways, from social work and special education services to student support groups and tutoring. “Service Learning is also an important part of the New Trier experience, and students are asked to participate in service projects throughout their four years at the school. Aside from the huge ACT difference, we see another difference: New Trier spends an average of $24K per student, while Dunbar spends an average of $10K. The figures may not be directly comparable, because Dunbar doesn’t break out Operational spending from Educational spending, but two facts are clear: New Trier spends more and has better results; Dunbar spends less and has worse results. Learning environment counts. Lack of heating or air conditioning, lack of books, computers and other materials, lack of non-academics like music, art, and gym all mitigate against the average overall learning experience. Clubs and other social programs produce a more well-rounded learning experience. While “throwing money at the problem,” won’t always produce better results — there are too many other variables in play — “starving the beast” is almost guaranteed to produce worse results. So, where there may be doubt about how much per-pupil spending is best, one may wish to err on the higher side especially if money is free. Grades K-12 are funded by the public, either through state and local taxes or through direct tuitions. And unlike the federal government, the public has limited funds. All states are financially challenged in that they are monetarily non-sovereign. Unlike federal taxpayers (who do not pay for federal spending), state and local taxpayers do pay for state and local government spending. State and local taxpayers pay for one of the largest expenses each state has: K-12 education. As a result of taxpayer resistance, many K-12 schools, especially schools in low-income areas, are insufficiently funded, some lacking even the most basic educational assets. The federal government should fund grades K-12 and remove that financial burden from the states and cities, and from their taxpayers. The federal government also should fund grades 13+, and remove that financial burden from parents and students. Because the U.S. federal government is Monetarily Sovereign, it neither has, nor can have, a financial “burden.” It creates dollars, ad hoc, by paying bills. No defense can be made of a system in which the financially challenged are required to pay for a service the financially unchallenged should support. Ho hum. Donald Trump lies again. Is this even news anymore? Oftentimes, the problem IS money. At Frederick Douglass Academy High School, where I am a veteran Chicago Public Schools mathematics teacher, we are constantly asked to do more for our students while fewer and fewer dollars are allocated to help us do so. We have only one full-time school counselor and one school psychologist, who is present only two days per week. We lean on outside organizations to provide after-school programming for our students and rely on teachers to implement restorative practices in the classroom to deal with the fallout from neighborhood violence. Each day, my classroom is filled with chronically stressed children who deal with enormous loss and tragedy. How do you console a student who has lost a friend to gun violence or is afraid to walk to school? They are anxious and crave attachment to people they can trust. They are also brilliant. Unfortunately, we often lack the resources and personnel to give these kids the support they need to realize their own brilliance and ensure that they don’t fall through the cracks. Yet with each new budget, each blow to the funding coming into our schools, it gets harder and harder to meet the needs of our students and provide them with the educational opportunities they deserve. In my own quest for answers, I learned that the state of Illinois accepted the primary responsibility for supporting public education when it rewrote its constitution in 1970. In the nearly 50 years since, elected officials have shirked this responsibility by failing to allocate the dollars needed to ensure all students’ educational needs are met. States are monetarily non-sovereign. Their spending is funded by taxpayers, and they can run short of money. The federal government is Monetarily Sovereign, its spending is not funded by taxpayers, and it cannot run short of money. The Illinois School Funding Reform Commission called for an additional $3.5 billion to be spent on schools over the next decade. We shouldn’t hold our collective breath. Illinois (sends) the least amount of money to the communities and students who need it most. Right-wingers tend to claim that the poor are hopeless, lazy, and beyond help, and that any money (aka “free stuff”) given them will make them even more hopeless, even lazier, and further beyond help. This is a vicious lie, brainwashed by the upper-income groups to keep the lower-income groups “in their place.” It was the excuse for slavery, and it remains the same excuse today. I think you should add that all K-12 scoops in the United States should get an equal amount for funding per student. Funding should not be based on the value of local real estate.